SW16 Norbury Dry & Steam Carpet Cleaning Services | RDA Cleaning & Maintenance Ltd.
A carpet usually occupies a central place in every house or apartment. So whether it is your working or living space you need give your best efforts to maintain your carpets in a top condition. Hiring expert carpet cleaners is a good step to begin with. And if you want to save yourself some time and money, you better book our professional carpet cleaning service in Norbury SW16. Here is our emergency number 020 3404 1646. As a reliable home or office carpet cleaning company in Norbury SW16, we will react quickly and provide you the quality service you deserve. Contact us at any convenient for you time. We work 7/7 from 8 am to 6pm. Hot water extraction carpet cleaning is a specific technique we use to remove stains from all carpet types. For a better result, before using hot steam to draw out the filth, we pre-treat the affected areas of the carpet with a special detergent. The detergent is chosen specifically to fit the fibers profile to ensure that we do not harm the material while extracting the stain. The pre-treatment procedure is done to make it easier for our cleaners to remove any stains, allowing us to successfully lift off any colouring from the carpet fibers. We are able to do so without harming the pigmentation of the carpet fibers. Once treated the spot is cleaned with a high powered pressure machine which blasts the area with hot steam. This dissolves the stain with the help of the previously applied detergent. 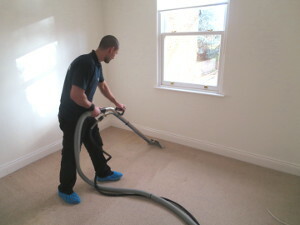 Any moisture that is being used is drawn out immediately after it's being injected into the carpet. There is residual moisture of about 5% which will fully dry out within 3-4 hours. The drying process can be quicker if you book our air-mover service in advance, it cuts down drying time by 75%. Dry carpet cleaning is a more delicate stain removal approach as it does not use any moisture or heat. Rather it relies on a smart method to not only extract stains, but also rejuvenate the fibers of the carpet without any damage. This is why we use this procedure to clean natural fibers like cotton and silk which would otherwise shrink from the water and heat of the steam treatment. To properly clean we would first hoover the affected area to remove any debris then we would apply the granulated detergent to the affected area. To activate it we would use a fine brush which embeds it into the fibers of the carpet and attaches it to the staining particles. After a 15 minute time span the cleaning technician uses a high powered vacuum machine to extract the detergent. All the office and domestic cleaning services we offer are conducted to the latest techniques and trends in all carpet types maintenance. Our skilled carpet cleaners mix the best stain removal techniques with various disinfection approaches to eliminate dust, grime, bacteria and allergen agents. In order to receive the best carpet cleaning service in Norbury SW16, all you need to do is dial this number 020 3404 1646 right away. RDA Cleaning & Maintenance Ltd. will respond as soon as possible. Same day and bank holiday appointments. No deposit or concealed fees.